For Sochi 2014, read Beijing 2008: it has long been hard to resist the temptation to bracket together the Olympic Movement’s principal recent flirtations with powerful, authoritarian states. Yesterday’s announcement that Russia is to set up public protest zones during the Sochi Games in February, as did China five years ago during its Olympics, makes the urge to draw comparisons irresistible. And this time around, I think the Movement may be pushing its luck. 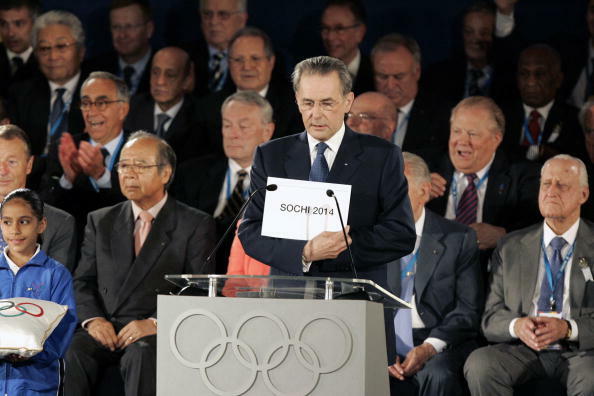 Taking its flagship product to China – as it agreed in 2001 to do at a Session held, by coincidence, in the Russian capital Moscow – was, though inevitable at some point, a colossal gamble for the International Olympic Committee (IOC). That the Movement came out of the exercise smelling, if not of roses, then of jasmine, was down, in large part, to the ineffable, jaw-dropping brilliance of a succession of star athletes. Against all odds, given the rumbling seven-year-long controversy over the choice of host, Beijing 2008 was the Games where the athletes returned to centerstage. An intoxicating cascade of superhuman performances by the likes of Michael Phelps, Kenenisa Bekele, Sir Chris Hoy and, most unforgettably of all, Usain Bolt simply expunged all background noise. Some will maintain, and some Russians in positions of authority may be calculating, that this is what always happens; that once competition starts, other concerns quickly melt away. I would argue though that until the 2008 vintage dramatically reversed the trend, the purely sporting content of successive Games had been growing steadily less memorable. It is the nature of the Winter Games that, even if the sporting feats, rather improbably, rival the heights attained at Beijing, broad tracts of the planet, rarely touched by snow and ice, are likely to remain largely unmoved by them. The human rights story, dramatized most particularly by the ongoing row over Russia’s anti-gay propaganda law, offers news organizations in places with only a passing, or intermittent, interest in events on Sochi’s pistes, rinks and runs a potentially compelling alternative focus. And while much of the industrialized north from Vancouver to Vladivostock will, clearly, be keeping a beady eye on the medals table, I would certainly include far-from-winter-sports-mad Britain on any list of countries where issues pertaining to Russia’s human rights record are likely to receive widespread coverage. None of this need unduly to concern Russian President Vladimir Putin, whose array of accomplishments was recently extended to overhauling his US counterpart Barack Obama at the top of Forbes magazine’s listing of the world’s most powerful people. The only constituency he needs to worry about – the Russian people – requires little excuse, in my experience, to display its patriotism. As long as Russian athletes fulfill their side of the bargain and the medals roll in, most will probably revel in their country’s month in the global spotlight and see in it further progress towards recuperation of something of the power and prestige it enjoyed in the cold war era. Putin, in any case, appears to be leaving nothing to chance, abruptly announcing this week the abolition of the RIA Novosti news agency and appointing a close ally, Dmitry Kiselyov, as head of its replacement organization. The PR challenge for the Olympic Movement is likely to require much more delicate handling. There is every indication that a large number of people in the liberal west, including no doubt relatively affluent consumers of products sold by Olympic sponsors, harbor negative thoughts of one sort or another about Russia’s human rights record. Relatively few of these, I suspect, would dash to the barricades; the power of social media, however, has grown exponentially since Beijing, enhancing the ability of skilful and committed campaigners to get their views across and to demonstrate widespread support. And this time I doubt the quality of the sporting spectacle will be consistently breathtaking enough to help get the Movement out of a corner. Imagine how uncomfortable it would be too if Olympic chiefs are obliged to discipline athletes for gestures of protest. All things considered, it seems to me we are entering a high-risk period for the painstakingly-constructed Olympic brand. With the explosive revenue growth enjoyed by the IOC in recent times set to slow markedly in the years ahead, it is particularly important that all steps be taken to keep any damage sustained to a minimum. Next articleTough Choices: Hit High Or Low on Tackle?